Ergonomics considers the unique relationship between the individual, the movements or tasks required of that person and the environment in which they are performed. When there is a mismatch between these elements, musculoskeletal disorders may result. 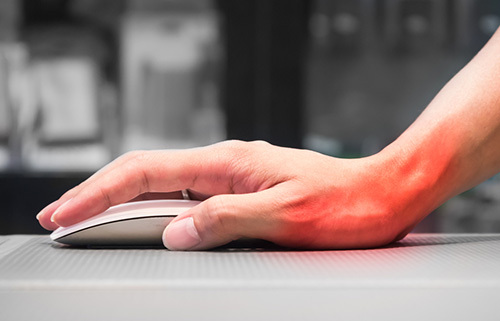 Common problems related to poor ergonomics include carpal tunnel syndrome, repetitive strain injuries, back pain and disc issues, headaches and neck pain. Injury based legal action, absenteeism, work errors and workplace fatigue are all higher in an ergonomically poor environment. An ergonomic assessment may be indicated for both remediation or prevention of further injury. When you book an ergonomic assessment your OT will first discuss your role and specific needs from your workstation and personal injury status. Ergonomic principles are applied but adjusted to suit each individual’s personal requirements. We place a lot of emphasis on client education to ensure that the changes are maintained in the long term. We find that if a client understands why a change has been made and it’s specific benefit to them, then they are far more likely to continue with those changes happily into the future. Good ergonomics should also be comfortable, functional and convenient. A report detailing any changes made is given to the client with any recommendations of equipment to be bought to enable optimal ergonomic set-up. Your OT will firstly try to use any equipment already currently available in the workplace before recommending any purchases. Specific stretches will be taught to client’s who require it and information given on how to maintain good ergonomics as a quick reference for the future should someone change their workstation temporarily.